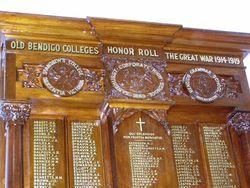 Old Bendigo Colleges Honour Roll commemorates those from the St. Andrews College, Sandhurst Corporate High School and the Bendigo Grammar School who served in World War One. 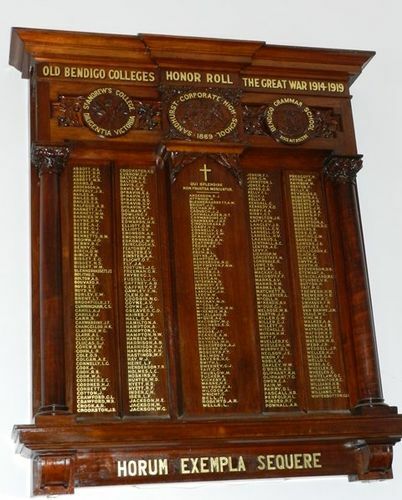 The Prime Minister, Mr. Hughes, has promised to be present at the unveiling by Sir William Birdwood of an honor roll of former students of the Corporate High School, St Andrews College and Sandhurst Grammar School who took part in the war. Age (Melbourne), 12 January 1920. Qui splendide non frustra moriuntur.